One of the perks of age is learning to cast away the things that aren't important. That helped this morning as I took a look around the house, assessed what I saw and declared an end to Christmas preparations. Basta! The day was crisp and clear and meant to be enjoyed. I grabbed my coat and headed out the door. I had a wonderful day. I accomplished nothing of importance but had an awfully good time doing nothing at all. I walked some along the river, lunched with a friend and relished the luxury of a midday nap. Dinner, too, was stressless. It was a crock-pot creation that turned out well enough to share with you. If you are looking for a quick holiday meal, I think you'll enjoy this simple dinner which has a Southwestern flair. If you'd like to make your own tomatillo salsa, a recipe can be found here. The recipe for the chicken appears below. 1) Mix all ingredients except cilantro in a 4 to 5-quart slow cooker. 2) Cover and cook on high 3 to 3-1/2 until chicken is cooked through. 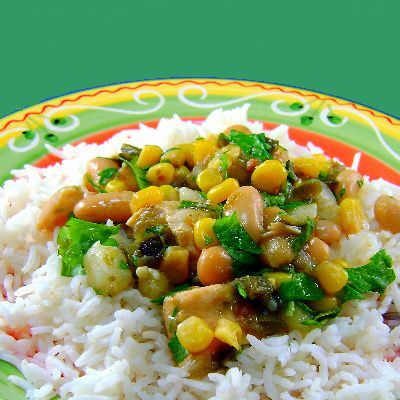 3) Stir in cilantro; serve over rice with lime wedges. Yield: 6 servings.